Oral statement – Progress has been made over the last several decades on recognizing the specific needs and vulnerabilities of women and girls. That progress, however, has been slow within the Human Rights Council, where, according to the OHCHR, only 4% of the over 400 thematic resolutions have an explicit reference to women’s rights and gender. 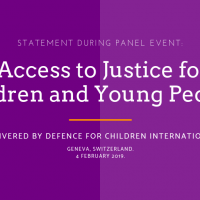 Defence for Children International, together Plan International and Terre des Hommes International Federation, present their recommendations to the Human Rights Council on how to better integrate the gender perspective into its work and to ensure that gender inequalities and stereotypes are effectively addressed.